While it’s hard to perform a “real-world” CPU benchmark test, Glenn suggested I try using the Geekbench CPU benchmark software. The software runs a series of CPU and memory tests and produces a Geekbench Score which provides a standardized way to compare CPU performance. To find out how much the three OS Power Plan options affected the performance of my T610, I first set the system BIOS in the Dell Setup program to “OS Control.” Dell not only allows you to set the BIOS to “OS Control,” which means the OS controls the power savings, it also includes other power savings options that are not controlled by the OS. I only tested the “OS Control” option. Test Hardware: Dell T610 Tower, with a single, 6-core CPU (Intel Xeon X5670, 2.93 Ghz, 12M Cache, HT, 1333MHz FSB); 32GB 1333MHz RAM; a PERC H700 RAID controller; two 146GB 15K SAS Drives; one dual-port HBA (to connect to the DAS); and dual network connections. Test Operating System: 64-bit Windows 2008 R2 (with current patches). 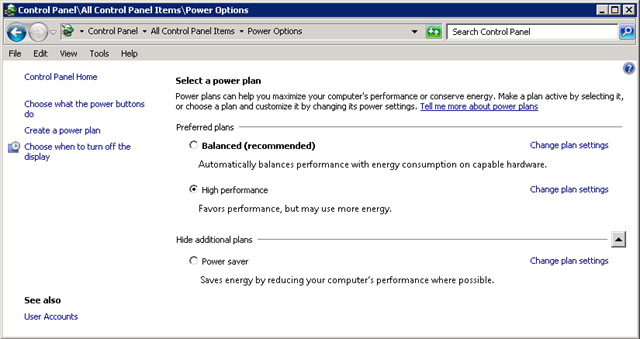 Next, I went to the Control Panel and changed the Power Plan setting to “High Performance”. 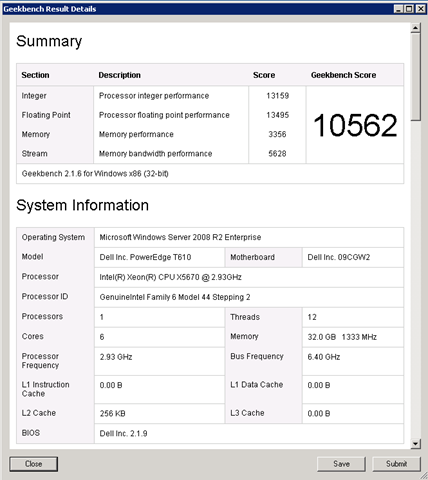 When I ran the test using the “High Performance” option, the Geekbench Score was 10,562. Next, I changed the Power Plan to the “Balanced” setting, and the Geekbench Score was 7,991, a drop of about 24% in performance from the “High Performance” setting. And last, I changed the Power Plan to the “Power Saver” setting, and the Geekbench Score was 7,075, about drop of about 33% in performance from the “High Performance” setting. While the OS Power Plan settings affect more than just CPU, it becomes obvious from this simple test that changing the Power Plan can significantly affect a CPU’s performance, which in turn could significantly impact the performance of a SQL Server instance. Of course, these three power options are available because they allow you to make a tradeoff between performance and power savings. As the DBA, you have to determine if the power saved by running the CPU more slowly is worth the performance tradeoff. The only way to really check this out would be to use a wattmeter to determine how much electricity is saved for each different settings. I don’t have a wattmeter to try this out, but Glenn has reported in some of his testing that the power savings appears to be insignificant, especially when compared to the significant drop in CPU performance between each “Power Saver” plan. The point of this post is that when your configure your SQL Server’s hardware, you need to investigate what the appropriate “Power Saver” plan your server should be running. Based on this simple, initial testing, I think I’ll leave mine on “High Performance”. This entry was posted in Database Administration, Hardware, Performance Tuning. Bookmark the permalink. I personally prefer to tweak the profiles using the Advanced Settings because I know there are some options that are enabled in the High Performance profile that aren’t needed. Dave, I also generally tweak the settings using Advanced Settings, but based on this test, I’ll be sure to perform benchmarks before and after each tweak just to see exactly how it affects the CPU. Excellent article. The difference is staggering, thanks for highlighting this! This is interesting. Was the cause directly the CPU being under powered? or rather the disk controllers/disks affected by the power save, which inturn acted as a bottleneck with Geekbench displaying the symptom? 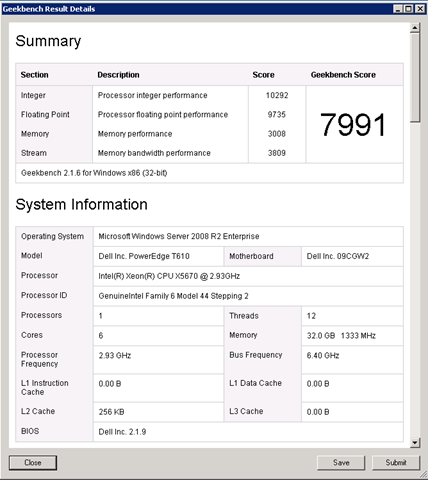 As far as I know, the Geekbench test is only for the CPU and the memory, not for any other devices in the server. In the future, I hope to do more testing on my DAS to see how its performance comes into play. I don’t have access to a SAN for testing, but I imagine that the results would be similar no matter what type of disk space is being used. Of course, the only way to know for sure is to test, as each hardware configuration is somewhat different. A white paper from Microsoft discussing the advantages and disadvantages of power saving modes in Windows Server 2008 and Windows 7. Interestingly the modern day ACPI allows for power management control between the software and the CPUs as well as the usual suspects (hard disk, monitors etc). You might say, ‘Well, duh, where you been TDZ?’. Well… I’ve been busy here in sunny New Zealand and we are still using egg cartons for servers. Not really. Anyway I digress. Another interesting point (which you may have already mentioned Brad – apologies… but i’m in the zone here and can’t scroll up to check…), is default Windows Server 2008 power management is set to BALANCED. Watch out for this guys and girls… As this definitely affects CPU throughput. I for one will be checking our servers out ASAP. On a different note, I’d love to see an article about: ‘Being Brad – a day in the life of…’…? Reckon it could happen? PS When you back in Wellington, Brad? Database Zealot–Thanks for the reference to the Microsoft paper. The link in your post doesn’t work, but I have fixed it and it works below. If you want to know a little more about what I do from day to day, check out this post: http://www.bradmcgehee.com/2010/06/travel-tips-from-an-intrepid-traveling-dba/, as it describes a little about my travel. When I am not traveling, I work out of my home office, eight hours a day writing (for the most part). Have no idea when I will be in Wellington next time. Depends on where Red Gate wants to send me. Next time I come, I hope to be able to spend more time.